An extraordinary Native American culture flourished in northwestern New Mexico before mysteriously disappearing around 1400 AD. 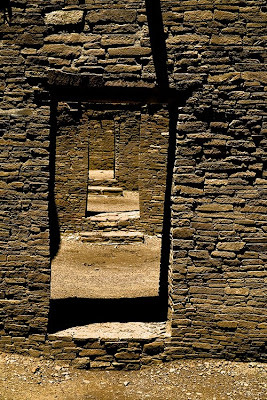 The Chacoans mastered a complex and highly precise construction process using flat stones rather than adobe to erect massive ceremonial structures in a pastoral mecca that was central to an ancient Puebloan religion. Thank you for the color photo, the earth tones are great, as is the geometry.